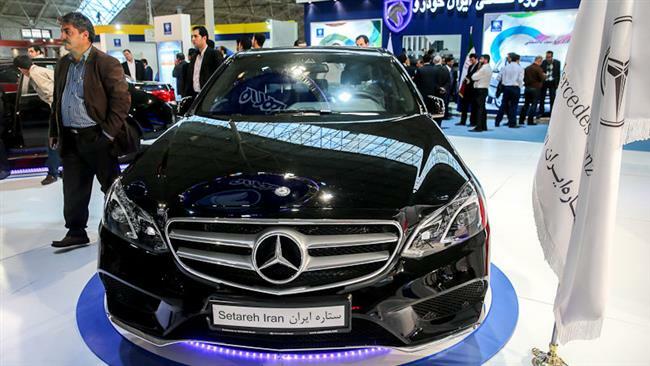 Iran Khodro presents Mercedes-Benz products at Tabriz Autoexpo 2014. Mercedes-Benz, a division of Daimler AG, will resume production of cars in Iran from the beginning of the new Persian year in March, ISNA news agency has reported. The company is about to produce 2,500 middle of the pack E-class cars in the year, with 20% of the production to be done inside Iran and the rest supplied to the country in the form of CKD (completely knocked down) kits. Mercedes-Benz has a long track record in Iran with a business dating back to the 1950s, where it sold up to 10,000 vehicles a year. However, the company stopped business in Iran after the US and Europeans intensified sanctions on the country in 2012. According to ISNA, the production line for Mercedes cars in Iran is currently being updated and prepared for resuming assembly. The contract goes back to January 2016 when Daimler signed letters of intent with local partners Iran Khodro Diesel and Mammut Group to arrange a “comprehensive re-entry” into Iran. In September, Mercedes-Benz signed a contract with Iran Khodro to resume distribution of its trucks in the country. The deal included creating a joint venture to provide sales and after-sale services in the Islamic Republic. Daimler has also indicated interest to return as a shareholder in the former engine joint venture Iranian Diesel Engine Manufacturing Co (IDEM) based in Tabriz to build diesel engines. Other German automaker Volkswagen started exporting cars to Iran in August after signing an agreement with Mammut Khodro for sales of VW brand models Tiguan and Passat. Iran is an extremely attractive market for international automakers. Since the lifting of sanctions on the country in early 2016, French carmakers PSA and Renault have pushed hard to regain lost ground after leaving the country when sanctions were imposed. On Tuesday, Peugeot said its global sales jumped by 15% last year on strong growth in Iran where the company sold 444,600 vehicles. Fars news agency meanwhile cited data released by Renault as showing year-on-year growth of 54% in sales to Iran where the automaker sold 144,862 cars in the year up to November. However, both Renault and Peugeot as well as other European automakers withdrew from Iran in 2012 when the country came under the Western sanctions. US President Donald Trump’s ultimatum to Congress and Europe to toughen a nuclear agreement with Iran has raised fresh questions about whether European countries would hold their ground.